In this blog post I will walk you through how and IoT device (for IoT Hub and IoT Edge gateway) can be created. The simulated device will generate telemetry data that will be used by IoT Edge Module (e.g. Clustering) to find out which device need to be replace or restart it etc. I will develop a Machine Learning model (k-means clustering) in R and will leverage in MachineLearningModel Edge Module to find which device need to be replaced or need to restart etc. Let’s develop a downstream device that generates above random data. 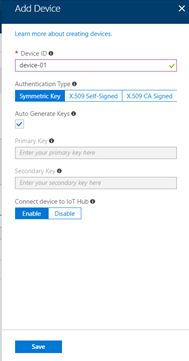 Follow https://docs.microsoft.com/en-us/azure/iot-hub/iot-hub-csharp-csharp-getstarted to setup you IoT Hub. I have got my IoT Hub setup now, I am creating a .Net console app that acts as device which generates some random data. Now, go to the device you just created and copy the primary connection string to respective .bat file. Repeat for 3 times to create 3 devices. So far we have created/simulated 3 devices that started sending temperature and other data to IoT Hub. These devices will be used to send the data to IoT Edge gateway (by appending GatewayHostName=<your-gateway-host-name> to device connection string) and I will explain in next blog so stay tuned.